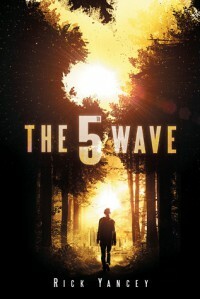 This book the 5th Wave is about aliens taking over the world. They take out the human population a using a series of waves. 1.) EMP 2.) Tsunami 3.) Plague 4.) Silencers 5.) Highly trained child soldiers that kill off the rest that the silencers didn't kill. The main point of view is from a high school student named Cassie Sulivan. She and the rest of her family besides her mother, she was killed during the 3rd wave. They go to a refugee camp. The "army" comes and takes the kids to Camp Haven and kill everybody else but Cassie hides in a ash pit. She is then hunted down by a silencer named Evan just so happens to be in love with her. He shots her making him take care of her then he tells her who he really is she doesn't leave in return she tells him that her little brother was taken and they go and get him back and make a few friends that help them escape the compound but they lose Evan.